Poke is Hawaiian raw fish salad, often served with tuna or octopus. The hit Hawaiian fish-entrée chain, Aloha Poké Co., has recently opened a location in Hyde Park, following a massively successful year of expansion for the Chicago-based company, as well as the growing poke trend across the continental U.S.
Like most of its fast poké and salad counterparts, poké bowls at Aloha Poké Co. are entirely customizable for set prices ($7.50 for a small, $9.50 for a large, and $14.50 for a whopping 24 ounces of food). Customers can choose from a base of white or brown rice or mixed greens, then add as many toppings as they wish. Only sashimi-grade ahi tuna and salmon are offered at this shop. Both can be served “naked” or marinated in a secret blend of sesame oil tossed with shoyu. Vegan and gluten-free options are also available. I ordered a big bowl of salmon on white rice, with furikake, crunch, edamame, plus their house Samurai sauce that tasted like Japanese eel sauce (sweet and tangy) with sesame oil. My boyfriend ordered a small Volcano bowl with marinated ahi tuna, which, according to him, tasted like a “spicy tuna roll unrolled into a bowl,” with a generous helping of seaweed, jalapeño bits, ginger, and tobiko topped with a chili ponzu mayo sauce. The friendly staff did not skimp on the fish, which was fresh and chewy without tasting sterile. Both bowls were satisfying and filling; neither of us could finish our respective bowls. Sauces were a bit on the sweet side, and the toppings offered clearly indicated a calculated move away from poke’s traditional Hawaiian roots, especially with the ever-trendy avocado being an option. 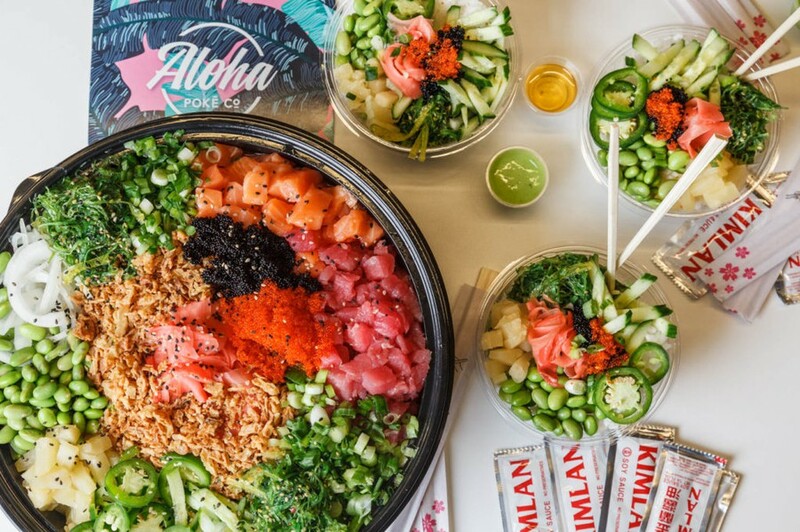 But Aloha Poké Co. is a fine addition to Hyde Park, which has recently gained more and more palatable pan-Asian options for students who have grown tired of Noodles Etc. Aloha Poké Co. is now open at 5221 South Harper Court, from 10 a.m. to 10 p.m. all days of the week.